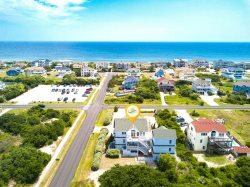 Enjoy beautiful views of the Atlantic Ocean from this end-unit townhouse that is within a short walking distance to the beaches of Nags Head! Seawind features three spacious bedrooms, each of which offers brand-new flooring for the 2018 season as well as comfortable beds and beachy décor. Located within the Atlantic Crest Townhomes community at milepost 11.5, Seawind fronts the beach road and is the closest unit in the entire building to the ocean. The complex also features an on-site community swimming pool so you can cool off after a hot day in the sun. Take your breakfast and morning cup of coffee out to the large sundeck to catch a glimpse of the sun rising out of the water, or just kickback in one of the Adirondack chairs to work on your tan and relax with a cool ocean breeze and a good book. When it’s time to hit the sandy shoreline for a day of fun in the sun, the beach is just a short 225-foot walk down the beach road to the nearby Bainbridge Street public beach access. After you work up an appetite splashing in the surf or strolling along the shoreline in search of seashells, head just a few steps to the south to the Nags Head Fishing Pier. This historic Outer Banks attraction features a tackle shop; pier house restaurant serving breakfast, lunch and dinner; and Capt. Andy’s Oceanfront Bar, which has an extensive food and beverage menu and offers some of the best views of the beach. In addition to the popular Nags Head Fishing Pier, Lucky 12 Tavern is also within walking distance when you spend your Outer Banks vacation at Seawind. Here you’ll find everything from burgers and barbecue to New York-style pizza, wings and local seafood—as well as a large sampling of North Carolina craft beers. Outdoor adventurers will love Seawind’s proximity to Jockey’s Ridge State Park—the largest sand dune system in the eastern United States—which is only one mile away. This Outer Banks landmark stands 1,000 feet tall in some places, making it the perfect spot to take in the incredible scenery from the top of the ridge. You’ll be treated to panoramic views of the barrier island, including the Atlantic Ocean, Roanoke Sound and Roanoke Island in the distance. Hike to the top just before sunset to catch a stunning display of colors as the sun sets into the shallow waters of the sound. When you vacation at this beautiful Nags Head townhome, you’ll have easy access to everything you could ever need on your Outer Banks vacation: ocean views, easy access to the beach and community pool, and a variety of local landmarks and attractions just minutes away! Book your stay at Seawind today! We loved staying with Seaside! We rented bikes with our beach gear package and had lots of fun! We will definitely be renting the same condo next year.